The SHS CNC Gen 3 Torque Up Gear Set with 10 teeth Sector Gear (32:1) is designed to compliment a high spring rate for those who seek a higher velocity AEG. The user will be able to pull a higher velocity spring but may notice a slower cycle rate. These high torque gears are designed to be used with M130-M150 springs. This makes it great for those that want to hit their expectations for a high FPS in their airsoft gun. We recommend that you consult or get assistance from an experienced Airsoft technician prior to attempting installation. Is this set a for 1/2 tooth pistion. It doesn't specify it's for 1/2 tooth but I just got it and the sector gears teeth hit pistion with the lower part of the gears. 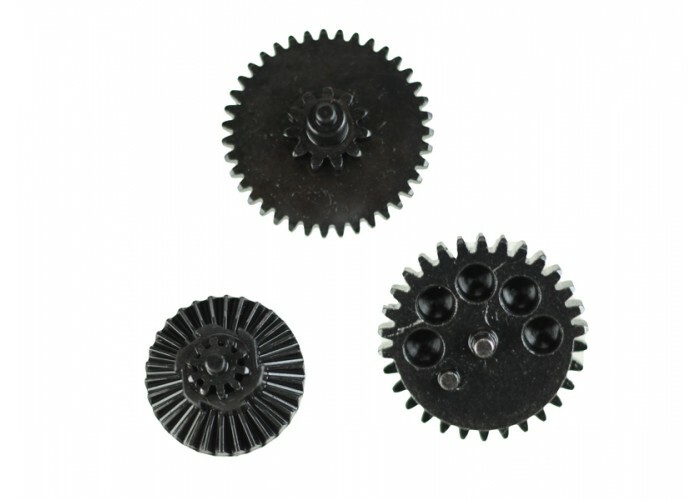 The description says: "The SHS CNC Gen 3 Torque Up Gear Set with 10 teeth Sector Gear (32:1) is designed to compliment a high spring rate for those who seek a higher velocity AEG. The user will be able to pull a higher velocity spring but may notice a slower cycle rate. These high torque gears are designed to be used with M130-M150 springs. This makes it great for those that want to hit their expectations for a high FPS in their airsoft gun. We recommend that you consult or get assistance from an experienced Airsoft technician prior to attempting installation." so it seems to be that the sector does have 10 teeth.